If you want the best, this is it. 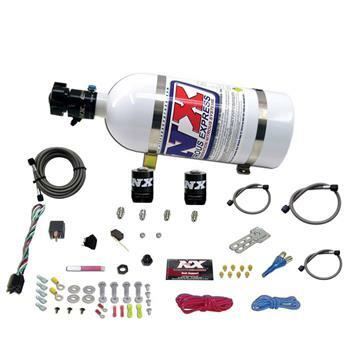 The NX EFI Race nitrous system is the top of the line EFI Single nozzle system. From the highest flowing solenoids, to our patented Shark nozzle, and billet aluminum Lightning bottle valve this system screams nothing but quality. This system includes a single Shark nozzle, nozzle mounting bung, Lightning series solenoids, stainless braided solenoid to nozzle lines, 4AN stainless braided nitrous feed line, 4AN fuel feed line, nickel plated fittings, wide open throttle switch, master arming switch, 40 Amp relay and relay harness, stainless bottle brackets and systems with a bottle include the Lightning bottle valve. This system includes jetting for 100, 150, 200 & 250HP. This system includes a 10lb nitrous bottle with the billet aluminum Lightning 500 bottle valve. This valve not only looks great; It is packed with features including two integrated gauge ports, 5/8 siphon tube, a large .500 orifice and an improved flow path with only one 45 degree turn. The Lightning bottle valve looks great, flows great and weighs nearly one full pound less than our old style brass valve.